The local's choice since 1999 - High Desert Frameworks is your full service custom picture framing design studio and large format digital printer. We are the only one stop, full service scanning, digital printing and custom framing solution in Central Oregon. We service Sisters, Redmond, Bend Oregon and all of Central Oregon. Custom Framing -- Award-Winning, Expert Design, Professional Framing, Archival Standards, Twenty-five plus years of experience counts! We guarantee our work and will repair any defect. With over 5500 samples to choose from, we provide one of the largest selection of picture frames in Central and Eastern Oregon. Need a wood frame, metal frame or unique frame, rest assured we have the best selection. You can rest assured you'll find a style that suits your taste, your picture or your budget. Don't worry -- We'll make it easy to choose from our selection of more than 5500 samples! Corporate Framing -- On Site Art & Framing Consultation! We'll make it easy with our creative and personalized solutions. Trade Framing -- Picture Framing Services for Architects, Design Professionals, Retail Galleries, and Furniture Stores. Digital Printing. Large / Wide and Small Format Printing Services -- Small and Large Format Digital Art and Photo Printing with Stellar Custom Framing. We are your solution for digital printing and framing your memories, family vacation and portrait photographs, posters, fine art prints and business presentations. For more information, please visit our Digital Printing Services page and then go to our upload page at: Upload Files. We are your one-stop custom picture framing and digital print design studio! Art and Photo Scanning Services-- High Desert Frameworks utilizes two professional top grade Epson art and film scanners to produce stunning results for our clients. We can scan and restore your old photographs and print to any size needed. For more information on our Scanning Services please visit: Scanning, If you are an artist we can scan your original art and then print fine art reproductions and giclee prints. For more information, please visit our Digital Printing Services page. Archival Framing -- We use the most up-to-date archival preservation methods and materials for the safety of your artwork. We stay current with accepted preservation practices through continuing education, and we constantly perfect our skills so that we can offer you the best possible protection for your valuable art. All framing projects, no matter how simple, receive the benefit of our 25 years of experience. Preservation Framing -- We provide the appropriate housing to display the intrinsic beauty and interest of an object, while prolonging its life by securing the object in a mechanically and chemically stable environment. It minimizes the problems caused by deterioration of the components of the object itself and other problems introduced by environmental factors such as air pollution, heat, light, and humidity. UV Protected Glazing -- We use only the best in glazing (picture frame glass) that protects your artwork. The following video highlights the value of UV Protection and our alliance with Tru Vue Museum and Conservation glazing products. Simply the best! 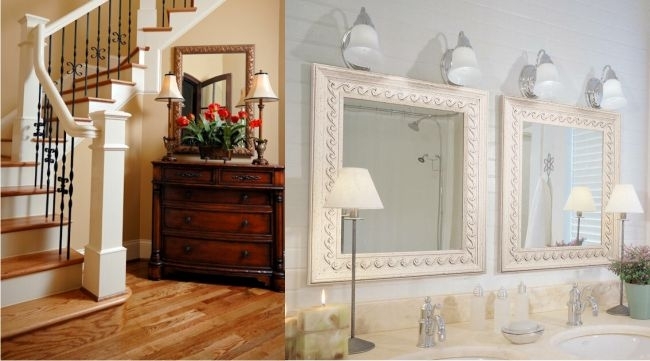 Mirror Framing -- A mirror is a wonderful way to jazz up a space. We invite you to visit our design studio to see our extensive selection of frame moldings. We can custom frame a mirror according to your specifications. Have a special vintage mirror, wall mirror, bathroom mirror that needs special framing? We can do it! Also, mirrors make a great gift for the holidays, for housewarmings, and for many other occasions. Specialty Mats -- Hand painting, french lines, special shape openings, V-Grooves, custom cut photo name mats and specialty cut shaped mats using our Computerized Mat Cutter. Needlepoint, Cross Stitch, and Fiber Art framing -- One of our specialties as we are known for our framing of counted cross-stitch, needlepoint, lacework, embroidery, crewel, crochet, quilts, tapestry, rugs and fiber art. Read about our Wish Upon A Card Signature Fundraiser. Photo Name Mats -- Choose your text, and graphics and we'll create a mat and framing combination that says the name of the new baby, your college or home town! Place your photos or art behind the mat/text opening and you have a wonderful collage. Closed Corner Frames --The ultimate in framing quality and craftsmanship. If you are looking for craftsman style frames, fine watergilded gold frames, or modern finished corner wood we can help design your order and create a treasure for your home or office. We also carry the line of computer–generated Prisma Frames. Made with clear or satin finish acrylic, by mixing and matching from a wide range of shapes, colors and patterns, you can create a look that is bold, sophisticated and fun. Wedding & Event Framing -- Capture the memories for a lifetime. Let us help you discover the many ways to preserve photos and memorabilia for all the wonderful celebratory occasions in your life. We are happy and honored to share some great ideas with you to help spark your creative imagination. Come in for a free consultation -- Bring your items, pictures, napkins, dried flowers and all and we'll make it sing. Hard Back Framing -- An alternative picture framing process for award, event posters and display advertising where your image is dry mounted onto Medium Density Fiberboard (MDF) and then sealed under heat and pressure with 80% UV protective matte finish vinyl lamination and finished with a beveled edge in your choice of over 30 colors. The final result is a non–glare, easy to clean, professional looking product at a fraction of the cost of traditional custom framing. Appointments -- High Desert Frameworks is open Monday through Friday 10am to 5:30pm and Saturday from 10am to 2pm. You do not need an appointment but if you want to plan ahead and schedule a specific time slot please use our online booking application. You can book same day or advance appointments. Email and text reminders are available at your option. Are you traditional? If so -- Just stop in or call 541-647-2191. If you need an appointment outside our normal hours please feel free to call or email us! Evening hours are no problem we just need to plan! Eco Friendly Framing -- We are committed to offering sustainable picture frame design by offering alternative choices in eco-conscious materials along with making conscious choices toward playing a role in protecting our environment. A number of our vendors have teamed with organizations to have an eco-friendly footprint on this world. We are pleased to carry a large selection of Roma mouldings. Roma’s suppliers are eco-friendly as well as their packaging. Picture Woods uses renewable, sustainable, and biodegradable North American hardwoods such as walnut, hard maple, cherry, white oak, and ash. Larson-Juhl partnered with American Forests to begin the Global ReLeaf ecosystem restoration project. Since then, Larson-Juhl has planted over a quarter of a million trees throughout the world. And we have many more vendors and suppliers that offer green solutions. Additionally High Desert Frameworks! recycles all of our plastic and cardboard products and we donate used frames to our local high schools for use in their art programs. Digital Printing Services -- Small and Large Format Digital Art and Photo Printing with Stellar Custom Framing. We are your solution for printing and framing your memories, family vacation and portrait photographs, posters, fine art prints and business presentations. For more information, please visit our Digital Printing Services page. Digital Photo Restoration -- We can help you with your digital photo restoration, preservation or duplication of your vintage photographs. We offer extensive digital repair, restoration and artistic effects and can provide consultation appointments and then help you with framing of the restored images. Do you have a special family photograph and need to "divide it up" between family members? We can help with professional and archival digital reproduction and printing. We are your one-stop custom picture framing and digital print design studio! Fine Art Giclee Printing -- We provided fine art scanning and printing services to local Central Oregon Artists on a retail and wholesale basis. For more information, please visit our Digital Printing Services page. TV - Flat Screen Framing -- Majority of today’s homes have a focal point and it’s usually a television set in the family room, den or living room. Consider having your flat screen wall mounted and framed like a piece of art. Framing your plasma or LCD TV adds a new dimension to your room and lends a sophisticated touch to your decor. Just as matching other furniture and objects in the room keeps a smooth, even look that would get a nod from any interior designer. Art Installation -- Standard installation of framed artwork by High Desert Frameworks! can be arranged. Installation charges varied and please contact us for a price quote and discussion. Picture Framing Supplies -- We stock a selection of standard framing supplies such as mat, foam core, backer board and picture framing glass for your small DIY picture frame projects. Call us with your questions or contact us for a price quote and discussion. Ready Made Frames -- We have a wide selection of unique photo frames, multi picture photo frame, and ready made frames in standard 4x6 frame, 5x7 frame, and 8x10 frame sizes and profiles. We also have unique ready-made frames built from left-over special-order mouldings that you will not find anywhere else! We also carry the line of computer–generated Prisma Frames. Made with clear or satin finish acrylic, by mixing and matching from a wide range of shapes, colors and patterns, you can create a look that is bold, sophisticated and fun. Local Central Oregon Artists -- Besides award-winning framing we also provide a showroom for artists that work in two and three dimensional work. Please visit us during our open hours. Bend Oregon and Event Posters -- We stock Bend Oregon posters and select event posters for your home or office. We offer traditional framing, poster framing, poster special discount and Hard Back Framing (see above). Vintage Maps and Posters -- Besides award-winning framing we also provide a showroom for vintage maps and posters from years gone by. Visit us soon to see what is new and exciting!